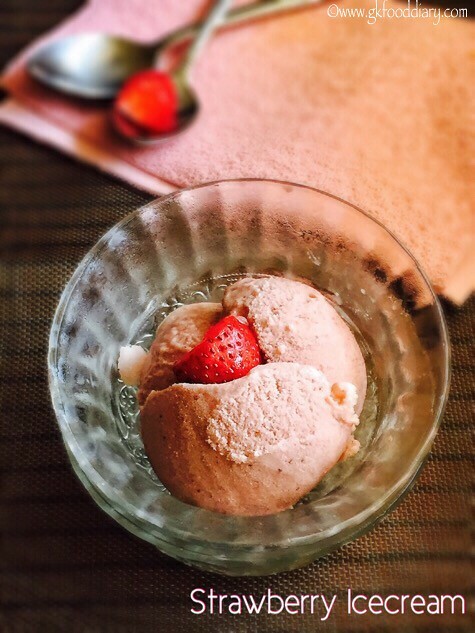 Strawberry ice cream- homemade, no churn ice cream recipe with strawberries, fresh cream and milk, made without Ice cream maker. 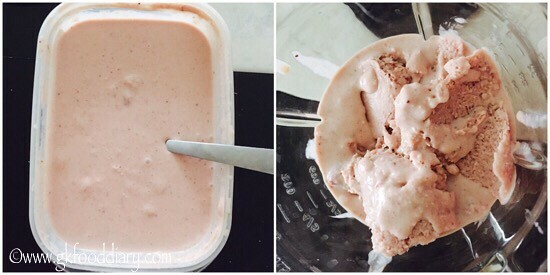 I slowly gained confidence to try making ice cream at home after experimenting kiwi Sorbet recipe. I am happy and satisfied with the outcome but sad that I made a very small batch it got over soon. The only key thing to get the perfect ice cream is blending and freezing repeatedly until you get the creamy texture, its sure time consuming but worth the effort. 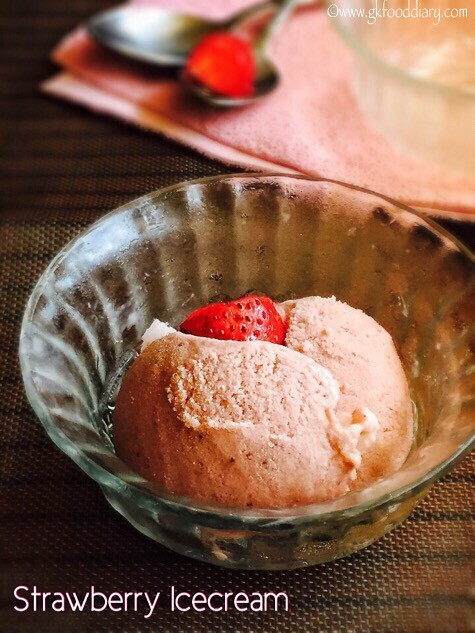 You can start giving this homemade strawberry ice cream to your kids after 1.5 years as a rare treat:) Now, Let’s get on to check how to make this homemade strawberry ice cream recipe for toddlers and kids. Boil milk in a heavy bottomed pan and simmer it until it reduces from the original quantity for 10 minutes. In the meantime, take corn flour in a bowl. Add 2 tbsp of milk to it. Mix corn flour and milk without any lumps. Set aside. 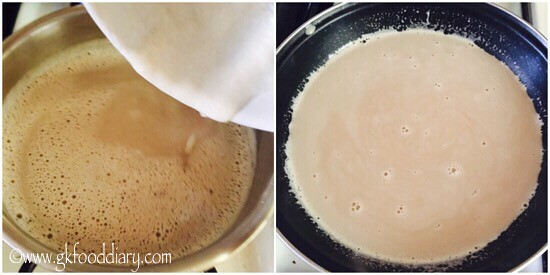 Once the milk is slightly thick, add sugar. Mix well. Then add cornflour milk paste to the milk and heat it further for 5 more minutes with occasional stirring. Switch off the flame once done and cool it down. Take fresh cream in a freezer safe container(freeze the container before 10 minutes of use) and beat it well until its soft. Once done, add milk sugar corn flour mixture to it and mix well. Wash the strawberries in running water thoroughly. Place it on a cutting board and slice the stem off the fruit. Then slice the fruit vertically or horizontally. 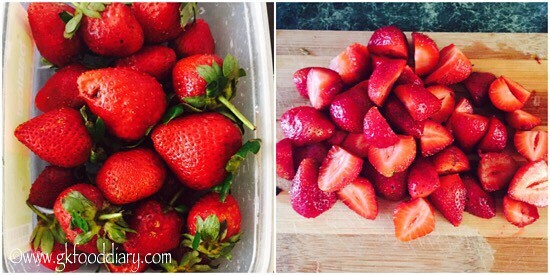 Then take the chopped strawberry pieces in a juicer/blender. Blend everything till smooth. 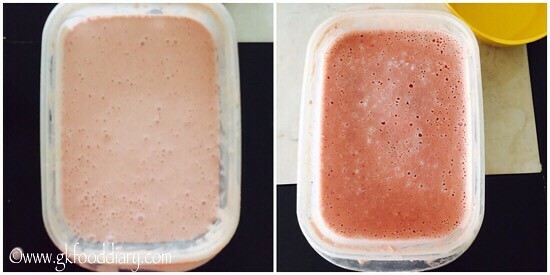 Then transfer the blended strawberry puree into the same freezer safe container where we have added fresh cream milk mixture. Mix everything well without any lumps. Now Place the container in a freezer and freeze it . After 2 hours, take the container from the freezer. Transfer the contents to a blender and blend again to a smooth paste. Do repeat this every 2-3 hours to get a smooth consistency. Repeat the blending and freezing at least 3-4 times. Then freeze it overnight or scoop out the ice cream after 4-5 hours. First it will be like a hard crystal, after 10 minutes it will be smooth. 1. 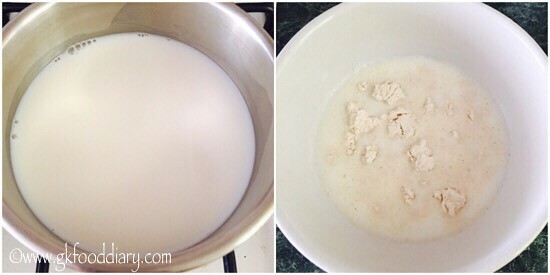 Boil milk in a heavy bottomed pan and simmer it until it reduces from the original quantity for 10 minutes. In the meantime, take corn flour in a bowl. Add 2 tbsp of milk to it. 2. Mix corn flour and milk without any lumps. Set aside. 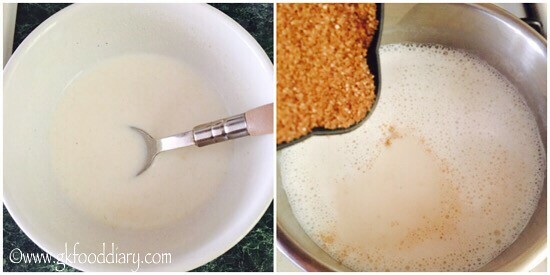 Once the milk is slightly thick, add sugar. Mix well. 3. Then add cornflour milk paste to the milk and heat it further for 5 more minutes with occasional stirring. Switch off the flame once done and cool it down. 4. 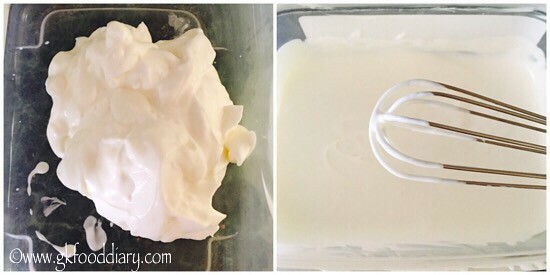 Take fresh cream in a freezer safe container(freeze the container before 10 minutes of use) and beat it well until its soft. Once done, add milk sugar corn flour mixture to it and mix well. 5. Wash the strawberries in running water thoroughly. Place it on a cutting board and slice the stem off the fruit. Then slice the fruit vertically or horizontally. 6. 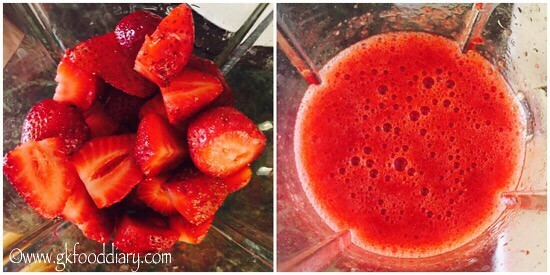 Then take the chopped strawberry pieces in a juicer/blender. Blend everything till smooth. 7. Then transfer the blended strawberry puree into the same freezer safe container where we have added fresh cream milk mixture. Mix everything well without any lumps. 8. 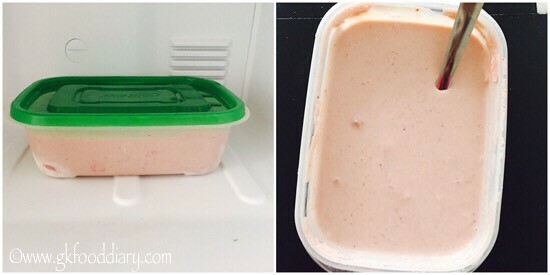 Now Place the container in a freezer and freeze it . After 2 hours, take the container from the freezer. 9. Transfer the contents to a blender and blend again to a smooth paste. Do repeat this every 2-3 hours to get a smooth consistency. Repeat the blending and freezing at least 3-4 times. 10. Then freeze it overnight or scoop out the ice cream after 4-5 hours. First it will be like a hard crystal, after 10 minutes it will be smooth. 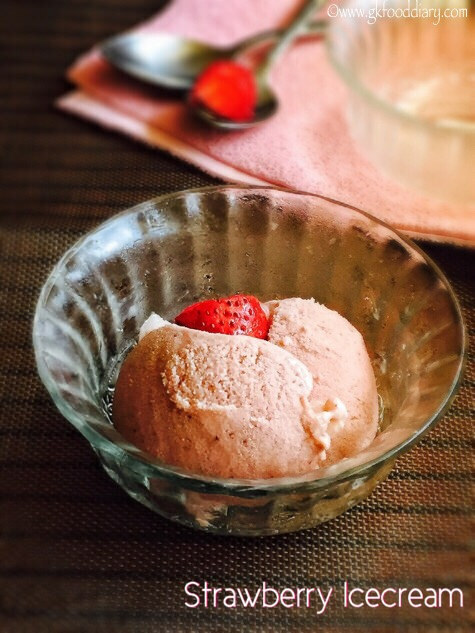 Serve the strawberry ice cream chilled. Hope you liked this recipe. To get regular updates, please like my facebook page GKFoodDiary or follow me through Google+,Twitter & Pintrest! Adding corn flour gives a nice texture to the ice cream, instead of corn flour you could use custard powder or milk powder. 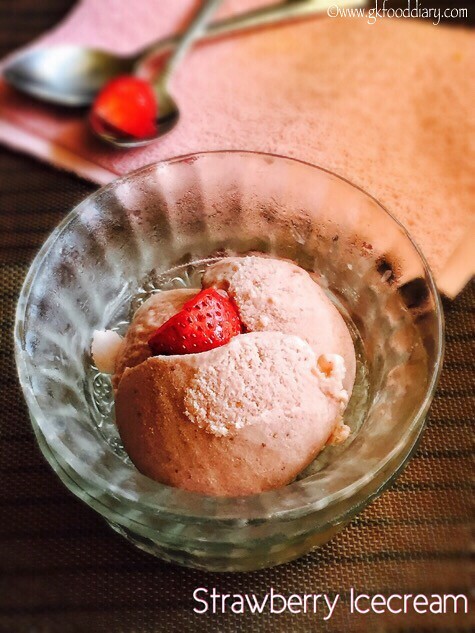 You can try this ice cream with any fruit of your choice. Method is the same. The more you blend the more creamier your ice cream will be. Freezing time totally depends on your freezer settings. Freeze the serving bowl before 30 minutes of serving so that your sorbets won’t melt quick. You could use white sugar to make this ice cream. Prefer brown sugar for a healthy version. Adjust sweetness according to the taste of strawberries. It stays well for 2 weeks in freezer. 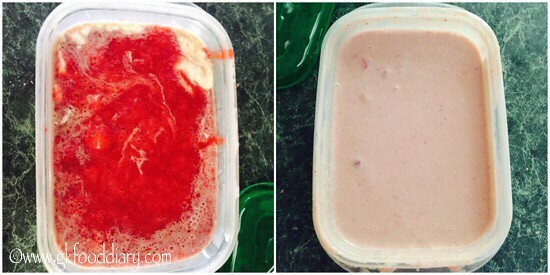 Make sure to introduce everything separate to your baby before you try this strawberry ice cream.